Mac, Ham and Cheese from “Mo’ Macaroni and Cheese” eBook. Can You Ever Have Too Much Mac and Cheese? Throw a Pizza Party with a one-minute pizza dough. Take a look at the fabulous pizzas we made in our Pizza Party Cooking Class! Armed with my one-minute Pizza dough recipe, we sampled some creative new ideas to add to my pizza repertoire. I have a confession to make. I am in love with the dessert from our Tapas Cooking Class. This is trouble. It is so easy to make that I literally just spent three minutes in the kitchen making it and am eating it as I’m penning this post. It contains items that I have around the house a lot. Bananas…sounds harmless, I used Liqueur Gaetano, but the Penelope Casas recipe used orujo or grappa and I’m sure you could improvise with whatever is in your liquor cabinet. Start with a little butter, brown sugar and items in the freezer…leftover chocolate sauce that I can nuke, sliced or slivered almonds and ice cream, well duh!! No matter how you slice it, this dessert is a winner! From ordinary bananas, no less. After making it five times, I have the recipe memorized and it requires literally no effort! The recipe was inspired from Penelope Casas’ One Pot Spanish. Perhaps the bananas are more special when you eat them in Spain’s Canary Islands where they grow them until ripened. But the ones that start out green from Dole work just fine for me! The Tapas party was a ton of fun as we were treated to tapas throughout the evening. Asparagus wrapped with ham, traditional toasts topped with manchego cheese, olives, anchovies, piquillo peppers. It turns out that the word tapa comes from the verb tapar (to cover) and Tapas (or the traditional toasts) were used to cover a glass of sherry at a bar so the flies wouldn’t take a swim. The bartender learned that serving food encouraged more drinking, so they came up with more savory snacks to serve their customers. Pork and Raisin Empanadas before and after the oven. Tapas like our Ham-Filled Mushroom Caps, Marinated Tuna Brochetas prepared by the team of Libby and Mike, the Spanish Tortilla made by Karen and Marty and the Pork and Raisin Empanadas. The Empanada team of Julie, Kate, Tracie and Vivienne had fun stuffing the small circles of dough with the pork and raisin mixture. These were gone in a flash! We enjoyed our Tapas while sipping down glasses of Sangria. Marinated Tuna Brochetas ready for the grill. To round out our meal, Pat, Julie and Gerry made us the traditional Lentil salad with blue cheese on the side. I love this salad cooked with onion & garlic for flavor and topped with ripe tomatoes, green and red pepper. You cannot use American lentils for this dish, as they will mush together. You need to find French, Spanish or Italian lentils, which stay whole when boiled for about 20 minutes. 1. Make Chocolate Sauce: Bring water in bottom of double boiler to a rapid boil. Lower heat and place chocolate, cream and butter in top of double boiler. Stir until smooth and set aside. 2. Make Banana Sauce. Melt butter in skillet over medium heat. Add the sugar, lemon zest, cinnamon and nutmeg and stir. Add the banana slices to coat with sugar mixture for a minute. Immediately add the liqueur. Cook for a minute until sauce is thickened. Immediately serve over ice cream. 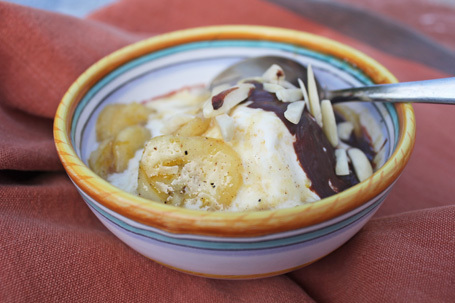 Top with a little chocolate sauce and sprinkle with almond slices.